The Janus kinase/signal transducer and activator of transcription (Jak/STAT) pathway conveys cytokine receptor and receptor tyrosine kinase activation signals to the nucleus, leading to alteration of gene expression involved in normal cell functioning, including growth, differentiation, and cell survival. Constitutive Jak/STAT activation has been identified in many epithelial malignancies, including head and neck cancer (HNC). STAT3 activation in HNC promotes cell cycle progression and prevents apoptotic cell death, resulting in the survival and proliferation of cancer cells. There is also evidence that this pathway stimulates neovascularization and establishes a pro-inflammatory state. Inhibition of aberrant STAT3 activity has been shown to impede HNC growth in vitro and in vivo, suggesting that strategies to block STAT3 activity may be valuable therapeutic modalities. A thorough understanding of the impact of Jak/STAT signaling is necessary to develop safe and effective targeted therapies for head and neck cancer. 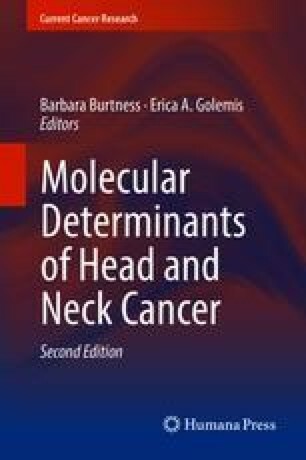 This chapter will review the fundamentals of Jak and STAT structure and function and introduce inhibitors of the pathway that are currently in preclinical testing, under clinical investigation, or approved for use. Borges GÁ, Rêgo DF, Assad DX, Coletta RD, De Luca Canto G, Guerra EN. In vivo and in vitro effects of curcumin on head and neck carcinoma: a systematic review. J Oral Pathol Med. 2016. https://doi.org/10.1111/jop.12455. Sun Y, Sang Z, Jiang Q, Ding X, Yu Y. Transcriptomic characterization of differential gene expression in oral squamous cell carcinoma: a meta-analysis of publicly available microarray data sets. Tumour Biol. 2016. https://doi.org/10.1007/s13277-016-5439-6.